On BC-Alberta boundary, NE of Prospectors Valley in Kootenay National Park, Kootenay Land District. Located southeast of Mount Fay, northwest of Mount Bell, and north of Chimney Peak. The name Quadra was derived by the fact that because of its blocky tower shaped appearance, it appears to have 4 summits. The north face of the mountain is steep and impressive, sitting above a glacier which itself sits above steep cliffs. When viewed from Consolation Valley, it is very impressive. Although not as steep, the south face is also very big and impressive. There is a Grade II Alpine route up the north face which is an ice climb. See Sean Dougherty's Selected Alpine Climbs in the Canadian Rockies for more information. 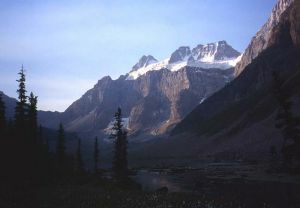 The mountain can be approached from Consolation Valley or from the Colgan Hut to gain the Fay-Quadra col.
Name Notes: Quadra Mountain adopted in 1924, later (mistakenly) changed to Mount Quadra in 1952, then changed back to Quadra Mountain in 1983. It was named for its four pinnacles, rather than after a person.